American Hydroformers prototyping services and capabilities allow engineers and designers to accurately test part feasibility and strength before full-scale manufacturing begins. 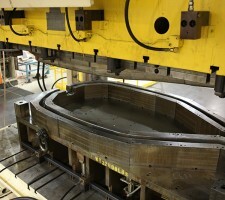 Utilizing the finite element analysis (FEA) computerized method and multiple software and stress simulations, our team of hydroforming technicians can help to accurately forecast real life performance and ability. Correctly predicting the effects of stress, strain, and thinning will ensure part integrity and usability. Our prototyping services provide an accurate part simulation without tooling or material costs and enables the necessary adjustments and modifications to be made before hard tooling construction begins. Additionally, our Universal Die Holder allows for prototype cavities to be made at a fraction of the investment needed for full production tooling. In addition to part prototyping, we are able to perform pre-production die trials and manufacturing test runs. Contact one of our sales representatives to find out more about our pre-production and prototyping services.